Tortilla Chips is one of the staple dishes in Mexican cuisine. Typically, most of us get that readymade packet of tortilla chips, but today I am going to show you an easy way to make homemade tortilla chips using maize flour. Past few weeks had been quite busy for me. That is the reason I could not spend any time on this space for more than 2 weeks now. First DH fell ill and then it was baby M's turn. When both got well, we had to travel for a marriage ceremony. Travelling with a toddler is so exhausting - there are so many little things to pack for every possible situation. After coming back - unpacking, laundry and getting the house in order! Uff.. the list goes on! To top that my regular maids have left and I feel like I am stranded in the middle of no where. You get my point right! But, then that's life. Nothing always go as planned. Enough of my rants for today, so, lets talk about food now. Last month I decided to join Srivalli's Blogging Marathon event for the month of June, so that I could be more regular in blogging here. For my first week, I chose the theme - Latin American Cuisine and spent quite some time exploring vegetarian options for various countries that come under the gamut of Latin America. But, in the end, due to time crunch, I decided to stick to some dishes that I have already tasted many times and I could re-create them at home, thus doing some justice to its taste. Latin America comprises of 19 sovereign states and many other territories and dependencies. Mexico is one of the Latin American countries. So, I chose to post a recipe for tortilla chips - one of the very popular snack to munch on from Mexico. Today I am sharing a simple recipe for Homemade Tortilla Chips made from scratch using maize flour. This recipe was shared to me by my sister in law. It is her mom's recipe. The only thing I changed was I used whole wheat flour instead of maida as needed in the recipe. When I searched about homemade tortilla chips online, most of the blogs just used ready made corn tortillas to make them. Since, corn tortillas are not readily available in India, anyone wanting to make tortilla chips at home can try this method of using maize flour - our humble makki ka aata. Since, maize flour is gluten free, we have to add wheat flour or maida to the dough, so that it helps in binding. Without much ado, let's check the recipe for Homemade Tortilla Chips now. 1. In a bowl take maize flour, whole wheat flour, salt and oil and mix well. Using the lukewarm water make stiff but smooth dough. 3. Divide the dough into 7-8 golf size balls. Using some whole wheat flour roll the balls one at a time into round circles of 5 to 6 inches diameter. Slice them into 6 triangle pieces just like we slice pizza. Pierce the pieces with fork. 4. Take the pieces off gently and place on a clean plate. Repeat the process with rest of the dough balls. When done, heat oil for deep frying. 5. Deep fry them in batches till they are light brown. You need to be extra careful while rolling the dough. If you roll it too thin it might break. Use flour for dusting as and when needed. 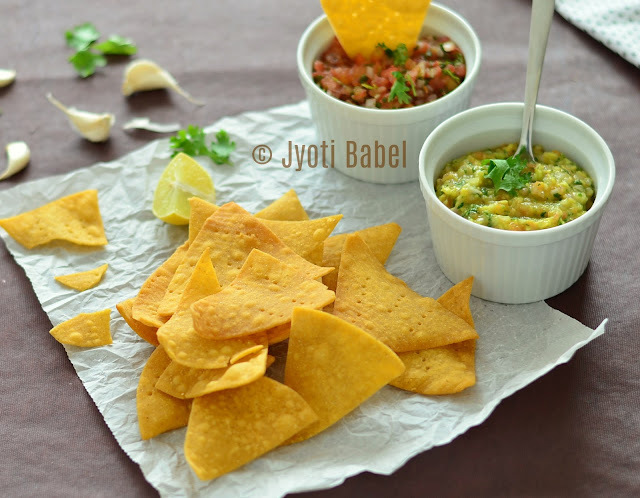 You can also check out my guacamole and roasted tomato salsa recipe to serve with these homemade tortilla chips. Welcome to the BM family . Good to see you here , though I have always admired your work at Pinterest.Lovely tortilla chips . Home made chips taste awesome , any day better than the store bought ones. I hope you are loving it here in BM. The tortilla chips look awesome. You have presented them beautifully.. Thanks Gayathri.. I am loving here in the BM family! How prefect those tortilla chips looks, feel like have this chips with some salsas. Love tortillas chips.. specially homemade. Welcome to the group! Love your tortilla pictures, they are so refreshing and makes me want to grab them right off the screen!..hope all is well on home front now.. Awesome Jyoti. Kudos for preparing this from scratch. :-) Welcome to the BM group. Looking forward to your recipes. Great job making these from scratch. The chips look so crisp and perfectly delectable. Indeed i was look forward to make tortilla from scratch and you posted it n the right time.. I will try your recipe :) Thanks for the share!! love tortilla chips and always try to make them at home. Awesome share for the theme. homemade chips must taste awesome! Welcome to the group. These look amazing. Will try making them for my 2. Welcome to BM group Jyoti. Tortialls chips from scratch look so crispy and inviting. My kids would finish that whole plate in no time.